Time to get back on the menu planning bandwagon. It is so easy to get sidetracked and forget to plan. Having the menu, makes my life so much easier in the long run, but sitting down and making the plan feels like such a daunting task, even though I know it truly doesn’t take that long. For the of May I am going to concentrate on getting dinners planned. In June I am going to concentrate on lunches and in July breakfasts. By the end of summer and the beginning of the new school year I will have the menu making routine back in place for all meals and snacks. Things at home and elsewhere became extremely busy since my last post, so the blog took a backseat. I am back, at at least until the next crisis hits. Mom ended up in the hospital with pneumonia for almost a week. Then we had to get everything set up for her home health aftercare It was a fun time all around, not difficult, just time consuming. When I arrived back home from Mom’s house, I found seven of the zoo inhabitants were sick. We took five to the doctor and three of them ended up on antibiotics for ear infections, bronchitis and/or sinus infections. Things have finally settled down and everyone is on the mend. Since I was gone so much over the past few months, things have gone downhill at home. I plan on spending the next month or so doing a top to bottom deep cleaning of the house, attitudes and behaviors that have gotten out of control over the during this madness and mayhem. I hope you are enjoying a wonderful Sunday with your family. I have to admit I have fallen in love with Sweet Tea. grew up in Northern Virginia, not exactly the deep south, but a southern state but I had never heard of sweet tea until until my future sister-in-law introduced me to it years ago. I never learned how to make it and relied on purchasing it the big gallon jugs from the store. Over time more and more of the companies started using High Fructose Corn Syrup in the tea. This has become a forbidden in this house. I decided to research how to make the tea and realize I should have done that years ago. It is so easy! I make a simple syrup and add to taste. The benefit of the syrup is you do not have undissolved sugar on the bottom of the glass. Plus you can use the syrup for so many other things. Slowly bring to a boil in small pan. Once sugar is dissolved, cool and pour into a jar and refrigerate. You can also flavor the syrup with lemon and/or mint once the mixture boils. Just add sliced lemons to taste (I use three). Remove from heat and let set for 15 minutes. Strain and cool. For mint add fresh mint springs to taste (I use a small handful). You can also combine them for a interesting flavor combination. Boil the 4 cups of cold water. Add the three tea bags into the water and let steep. I let mine steep about 10 minutes since I like strong tea. Remove the tea bags and pour into a heat resistant pitcher. Then add the cold water. When you are read to serve, pour the simple syrup into the glass, fill with ice and then pour the tea and do a quick stir. A wonderful, homemade drink which is better for you than soda. It has been a long couple of months at the Zoo. Lots happening. Liz has returned for her second semester at the community college and is doing great. She was still dealing with headaches, so the doctors scheduled another pressure monitoring of her shunt. So now the doctors can treat the headaches as true migraines. She has been given medicine and for the first time in nearly two years she mostly pain free! We all are praising God. Mandy is completing her last quarter in high school. She is doing well, but is entering the test zone in the next month. Since she in the International Baccalaureate program she has a test in every subject that goes toward the IB diploma. In addition she has a AP statistics exam. All of these tests happen between April 24th and May 15th. So it is crunch time for her. She was accepted into several universities and has decided on attending Mount Saint Mary’s in Emmitsburg, MD. She loved it when Liz was there, but was afraid Liz would be upset if she went there. Liz is thrilled she is going to be attending and can’t wait to visit the campus again. Douglas and the rest of the crew are doing well. Homeschooling is moving along. We have had couple of tweaks and are a bit behind in some areas, but that is beauty of homeschooling, you are truly never behind and is just a matter of you are where you are. The little ones are starting to participate more in the homeschooling and I have started designing their program for next year. I will probably start them this summer since they can’t wait to do more. I love their enthusiasm. Richard is enjoying retirement and helping out with homeschooling history. He has a passion for it, and children are benefiting from that passion. For me it was just a subject I had to endure to get to my science classes. So they are getting the best of both worlds. A parent that loves history and parent that loves the sciences. Today we celebrate the Second Sunday of Easter. Also known as Diving Mercy Sunday. I have a few people want to know what Divine Mercy Sunday is exactly. This is taken from the Shrine of Divine Mercy website. It provides a wonderful explanation. 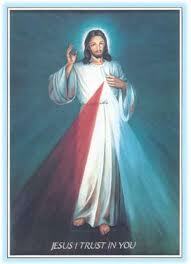 I often pray the Divine Mercy Chaplet. It contains wonderful prayers and is quicker than reciting a full rosary on days when my time is crunched. If you are interested in learning the Chaplet, you can check out How to Pray the Divine Mercy Chaplet.